The hustle to the graduation finish line is very real. From our studies, jobs, and working to secure the perfect internship, it may seem like there isn’t “time” to get involved and help tackle those opportunities we know will make our campus better. But, that’s where you’re wrong. Getting involved is a lot easier than you think. The SGA Tiger Council grants students the opportunity to volunteer with the Student Government Association without holding an office. From working with special events, helping gather and share the student voice on campus, to working hand-in-hand with campus leaders, Tiger Council is a great way to facilitate meaningful changes here on campus. Do you know that there are more than 50 dedicated student leaders working to make sure you have the best student experience possible on campus? When you have feedback, these leaders have the ability to help you impact change. If you haven’t already, virtually “meet” and follow your student leadership organizations today. They include your Student Government Association, the Favrot Student Union Board, and many other student organizations. Follow the 2018-19 Favrot Student Union on Instagram at @whatsupwithfsub. Follow the 2018-19 Student Government Association on Instagram @Grambling_SGA, on Twitter @Grambling_SGA, and on Facebook at @GramblingStateSGA. 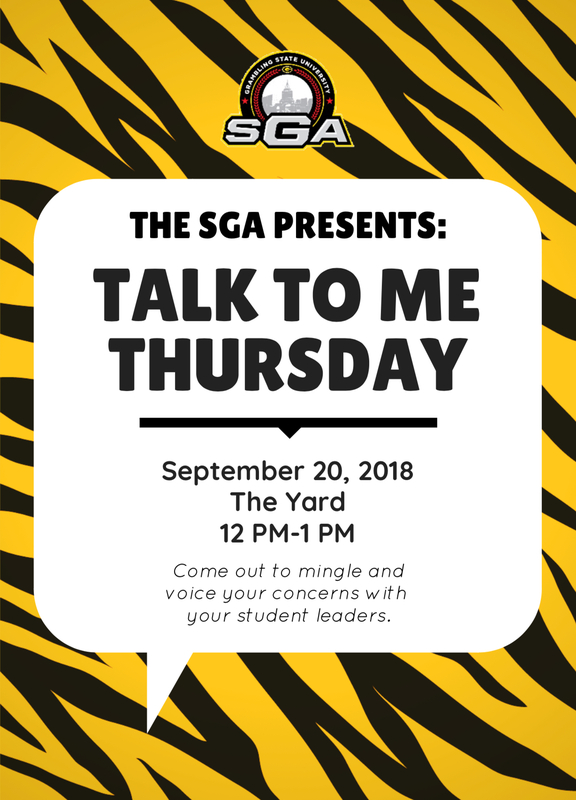 This semester every other Thursday, SGA leaders and staff are hosting “Talk to Me Thursdays.” This event is your chance to provide feedback on any part of the campus experience – from dining to our major events. 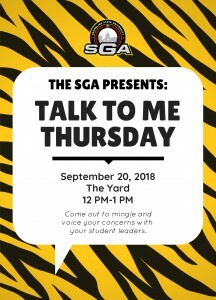 Your leaders want to hear from you, follow https://www.facebook.com/GramblingStateSGA/ for event times and dates. Interested in volunteering to help GSU grow? This semester on Friday’s, beginning September 14, 2018, meet the SGA on the Yard at 12 Noon or visit us upstairs in the Favrot Student Union to get involved. We will need help with picking up trash on campus, maintaining the community garden, restoring Charles P. Adams Park, taking down old event flyers, recycling paper, plastic, etc. AND MUCH MORE…We’re looking forward to your help! You don’t have to be an officer to create positive change at Grambling State. We encourage you to use these four easy ways to share your voice and help our leaders, faculty, and staff continue to grow Grambling State. This entry was posted in Uncategorized on September 10, 2018 by Jovan Hackley.